I have seen quite a few articles recently suggesting that blockchain technology can be used to help combat invoice finance fraud. I have written before about the benefits of using blockchain in an invoice finance scenario. The first time I came across this application was an organisation called Populous who are presently are launching what they believe to be the first blockchain based invoice discounting platform. The product uses flat-pegged "Pokens" cryptocurrency on their platform, which allow investors from all over the world to invest in funding invoices in all currencies, without the problems of geographic boundaries. Apparently the Pokens are pegged 1:1 against major currencies, to minimise exposure to value fluctuations. "Blockchain technology eliminates the inefficiencies and risks of manual contract origin and processing, associated manual errors, and duplication of invoice financing. This makes value propositions such as micropayments more feasible. For example, when a smart contract is executed between an invoice buyer and an invoice seller, 80% of the funds will be released to the invoice seller via the smart contract. Payment is only confirmed when the transaction is entered into the distributed ledger and the crowd-funding process is then closed. All legal requirements are written into the smart contract which are legally binding when executed. The smart contract prevents fraud since the smart contract will not allow invoices that have already been financed to receive duplicate financing. Therefore, a smart contract acts as a built-in protective layer on a blockchain ledger." "One of the biggest problems of traditional invoice financing is that it is a centralized system where there is a large scope of manipulations and fraud. However, in case of a blockchain based system, the chances of a fraud drop dramatically low. This is because this is a decentralized system on a public ledger. Basically, all the parties involved in the process, i.e., the buyer, the seller and the creditor can see any changes or updates made to the invoices. Moreover, to make these changes or updates, permission from all the parties is needed. Once all the parties approve and a change or an update is made, it is permanent and cannot be changed later on. This makes records permanent and transparent." A similar kind of approach is also being used by Reserve Bank of India - sponsored Trade Receivable e-Discounting System (TReDS), which has just launched in India, using blockchain to address the issue of avoiding duplicate invoices being discounted by multiple funders using the system. One article that I read about using blockchain in receivables financing, stressed that whilst the blockchain was being used there was no cryptocurrency involved, which may be a relief to many that will be worried about the volatility of cryptocurrencies. Whilst I can understand that this technology can be used to avoid duplicate invoices, invoice financiers have had such risk processes in place for may years as this is an age old problem. Of course this does not allow them to ensure no other funders are discounting the same invoice, but that could still require them to be using a similar platform in order to gain that benefit. The other issue is that the blockchain only addresses the validity of the financial transaction, it does not ensure that the underlying transaction is fraud free. For example, if goods have not been delivered, or if the buyer and seller are in collusion, the use of blockchain is unlikely to help identify this. 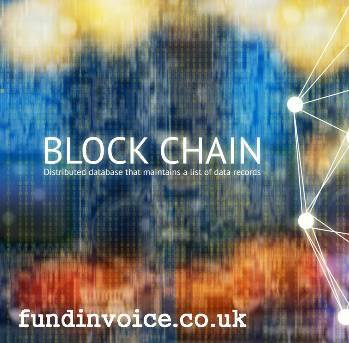 I remain interested to hear if any of the mainstream UK invoice financiers are looking at blockchain?